WASHINGTON, Nov. 1 (UPI) -- North Korean women activists who experienced rights abuses in North Korea and China protested Beijing's forced repatriation of North Korean refugees on Tuesday. 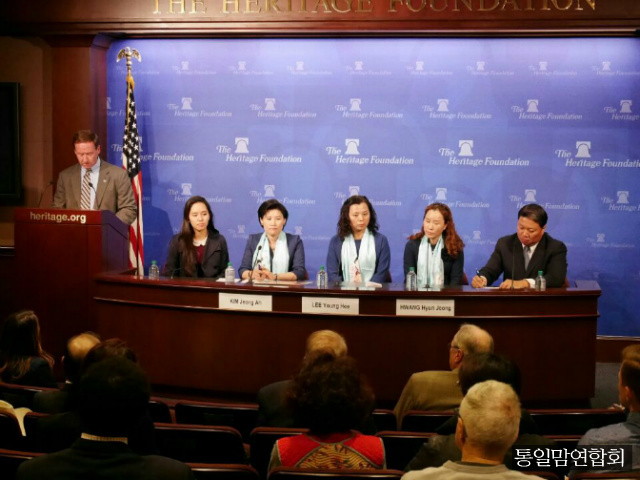 Speaking at a Heritage Foundation forum addressing the issue of human trafficking in China, three North Korean defector-activists said China's repatriation policy forces women to give up their children, Yonhap reported. Kim Jeong-ah, founder and executive director of Tongil Mom, a group of North Korean women who seek to be reunited with their children, said the Chinese government's unilateral policy of forced repatriation must come to an end. Kim, who defected from North Korea, said the policy leaves no choice for women defectors but to leave their children behind, whether they resettle in China through legitimate means or are human trafficking victims. Kim also said North Korean women who are pregnant undergo abortions in North Korea after repatriation. Women who settle in China are often forced into marriage or agree to live with Chinese "husbands," according to the Heritage Foundation. Hwang Hyun-jeong, a defector and member of Tongil Mom, said she suffered countless human rights abuses during her time in China. But Hwang said whether it is human trafficking or beatings, women defectors often hide their ordeal due to a sense of shame they feel about their experiences. Lee Young-hee, another Tongil Mom member, said she had to leave behind a four-year-old son in China. Lee said she had married a Chinese national in compliance with local law, but her status did not guarantee her immunity from arrest and deportation. The lack of security in China prompted Lee to leave and to make the hard choice of abandoning her son, according to Yonhap. 자신의 아이들과 다시 만나기를 희망하는 북한 탈북 여성 단체 통일맘의 대표 김정아씨는 중국 정보의 독단적인 강제 북송 정책은 끝나야 한다고 말했다. 중국에 남겨두는 것 이외에 선택의 여지가 없었다고 말했다. 김정아씨는 임신 중인 탈북여성이 북송 되어 북한에서 낙태 수술을 받았다고 전했다. 해리티지 재단에 따르면 중국에 거주하는 여성들은 종종 강제로 결혼하거나 중국인 '남편'과 사는 것에 동의한다고 한다. 탈북자이자 통일 맘의 일원인 황현정씨는 중국에 있는 동안 수많은 인권 유린을 겪었다고 말했다. 또 다른 통일맘 회원인 이영희씨는 중국에 4살짜리 아들을 남겨두었다고 말했다. 연합뉴스에 따르면 중국의 안보 불감증으로 인해 이씨는 자신의 아들을 버리고 떠나는 힘든 선택을 했다고 한다.